Home » Posts Tagged "HB 2410"
The House this morning passed Sub for HB 2410 on final action on a vote of 84 to 39, moving it on to the Senate. The Senate meanwhile has crafted their own school finance bill which was originally in SB 251 but on moving it out of committee, it was put into HB 2186. We now know what’s in HB 2410 and can report that we believe the policy in the bill makes for a good school finance plan and will likely be found to be constitutional. The bad news is that the funding in the bill remains low and we expect the Court to call it inadequate. 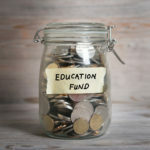 Funding for mentor teacher and professional development programs. The bill contains many provisions that re-enact elements of the school finance formula that was in place before its repeal and replacement by the unconstitutional block grant system. The bill also makes changes to the corporate tuition tax credit scholarship program. The bill would require that private schools receiving students under the program be accredited by the State Board of Education. Eligible students would have to be in one of the 100 lowest performing schools as determined by the Kansas State Department of Education and be free lunch eligible. 50% of those students would also have to be directly certified by the Department of Children and Families. While KNEA still opposes the payment of state monies either directly or indirectly to private schools, HB 2410 makes significant improvements to the program. The Senate Bill, contained in Sub for HB 2186, is perhaps a different animal altogether. While it started out similar to HB 2410, there are a number of significant differences including an even lower funding level. In crafting the bill, while legislators had a copy of SB 251 as drawn up for Senator Denning, very few amendments were submitted in written form. They were offered and debated as “conceptual” amendments all of which were further amended by more conceptual amendments. With nothing in writing it was very difficult to determine the impact of most of the amendments ultimately adopted. As of today, the amended bill was not available for review. So we apologize, but we will have to wait to report to you on the specifics of the bill until we have had the chance to read it. The word under the dome is that the Senate will caucus on HB 2186 on Tuesday with a vote to follow on Wednesday. If this bill passes, it is possible that the two chambers will go directly to conference with their two versions of school finance as the guides. And just remember – we have a long way to go before this is done. The Senate must deal with a school finance bill and then a House/Senate Conference Committee will need to hammer out the differences before a final bill can be submitted to the Governor and ultimately the Supreme Court. Yes, funding is needed. Something the state does not have right now. A tax plan that restores revenue to the state and allows for an increase in school funding has yet to be passed. On Monday, the House defeated a tax conference committee report in SB 30 that would have restored three income tax brackets, repealed the glide path to zero, and ended the LLC tax loophole. The no votes came from conservatives who don’t believe there is a revenue problem or that schools need more money and from Democrats who pointed out that the bill was not big enough to fund the current budget and increase school funding. Like HB 2410, KNEA believes that SB 30 (the Monday version) was the right policy but we agreed that more would need to be done to fund schools. We supported the bill because it would have put the income tax system back on firm ground but we agreed that a second bill would be necessary to cover school funding increases. The House put SB 30 back in committee and the next version to come out was a smaller, more anemic bill. This time we opposed SB 30. And apparently, a lot of legislators did as well because it was pulled before it hit the floor. Okay, so here’s the problem in following along – SB 30 is the tax bill. It is the tax bill over and over (Groundhog Day?) and each time it emerges out of its hole, it’s different. Sometimes it’s good; sometimes it’s bad. The next tax bill is likely to be SB 30 and we don’t know if it will be a good SB 30 or a bad SB 30. But look for it on Tuesday or Wednesday of next week. Should We Be Mad That There is a Four-Day Weekend? We know, it seems somehow wrong that as soon as they hit 101 days, they decided to take a four-day weekend. But this has been an extraordinary week under the dome. They have been building tax plans, debating them, arguing about them. The House has finally passed a school finance plan that was the result of a lot of hard work and long hours. This week they’ve been meeting late into the evening and it has been trying. We know we are exhausted and we also know that they are exhausted. And knowing that good work is seldom done by the unrested, we hope that they will use the long weekend to relax and refresh. That’s what we will do. But here’s the big thing – we are fully expecting them to come back on Tuesday rested and ready to roll up their sleeves. There’s still a lot to be done and we’re about out of time. There will be long days and night work ahead. The Senate Select Committee on Education Finance has been holding committee meetings lately to talk about what the House has done so far on an education finance bill. The House bill, Sub for HB 2410, is sitting in limbo, not yet scheduled for debate on the House floor so, in reality, the final House bill is not done. When it does finally reach the floor it will be subject to amendments and most people feel that it very likely to be amended. So we found it interesting that the Senate Committee, chaired by Sen. Jim Denning (R-Shawnee), scheduled hearings on Sub for HB 2410 starting today. This left many of us in a bit of confusion. Denning has been announcing his ideas on school finance – or at least on adjustments to HB 2410 – that will make up a Senate position. While we (KNEA) wrote our testimony purely on HB 2410 as it came out of the House Committee, we did get a quick look at Denning’s bill (SB 251) and listened to the revisor’s explanation which allowed us to speak to the differences between it and HB 2410. Senate Bill 251 started with the House bill and made a few adjustments. 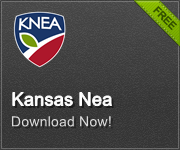 eliminate the local enhancement fund for schools with the least at-risk students (KNEA supports the Senate position). Both bills provide for all-day kindergarten, mentor teacher program funding, and professional development funding (KNEA supports all three). What might be Denning’s most troubling idea is to fund schools through a surcharge on utilities. He proposes putting a $2.25/month charge on all three residential utility bills (gas, electric, and water) and a $10/month charge on those bills for businesses. Every Kansan would pay an additional $6.75/month for utilities to fund a school finance increase. There are other parts to this as well such as a $120 annual charge on farmers who irrigate. This proposal has already come under widespread disapproval as regressive and unfair. It’s hard to see much support for the idea in either chamber. Testifying on the bill today were Olathe Schools, City of Olathe, Pratt Schools, Bonner Springs Schools, KASB, Insight Virtual Schools, The Alliance for Childhood Education, Kansas Policy Institute, and of course KNEA. The hearing will continue tomorrow morning. All testimony is expected to be finished tomorrow and Chairman Denning suggested he might begin working the bill tomorrow. He has also suggested that they may work on Saturday. The Tax Conference Committee met this evening we had hoped that they would produce an agreement on the House proposal to simply repeal the 2012 Brownback tax disaster. At issue was which chamber would run the proposal first. When the Senate conferees said they would not entertain the idea of both chambers running it simultaneously, the conference committee ended without agreement. And so we go back to waiting. We’ll see what shakes out tomorrow. With the completion of the school finance bill (Sub for HB 2410) done Monday evening and a new proposal on taxes (complete repeal of the Brownback tax failure), things seem to have come to a block under the dome. The school finance bill is ready but as of yet no debate has been set for the floor. And we have yet to see the tax proposal together. The Senate Select Committee on Education Funding is already studying the House bill, having scheduled briefings on it and announcing today that there would be a hearing beginning tomorrow. So the Senate Committee is not wasting any time and working as if the bill has already passed. The interesting twist in this is that the bill we will be testifying on in the Senate is the one that came out of the House committee and there is a strong possibility that the bill will be changed dramatically in House floor debate. On the positive side, this speeds up the process a little bit. We are of course wondering why the hold-up and can only speculate. Leadership may be debating whether to deal with taxes or schools first or perhaps they are trying to persuade enough Republicans to support the anemic bill that came out of committee. Whatever it is, we are in a holding pattern for right now so keep checking back here for updates. Brownback and his allies in the legislature who owe their allegiance to the National Rifle Association (NRA), passed legislation that allows guns to be carried just about anywhere by anyone at any time. This means that starting on July 1, 2017, anyone can carry a concealed weapon into a hospital including the state mental hospitals or in any building on any college campus. The only way they can be prohibited is if the hospital or college were to secure every entrance with metal detectors and security guards at an enormous cost to the institution. How bad is it? 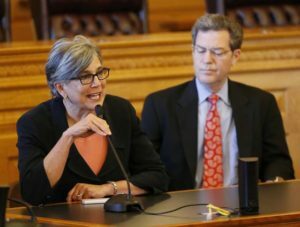 Brownback, who happily signed the bill into law, suddenly found out what it did and asked the legislature to give him $24 million to secure the state hospitals so that guns could be prohibited. Can you imagine what it would cost to secure the University of Kansas or Kansas State or any of our other post-secondary institutions including community colleges? 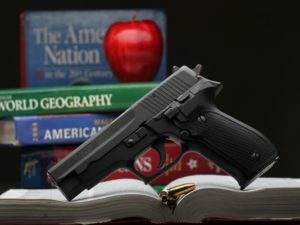 Several attempts have been made this year to change the law to allow colleges and hospitals to have control over guns in their facilities and, despite there being overwhelming public support for keeping guns off campus – support from parents, students, faculty, and administration – the NRA has kept a tight control over the Kansas House and Senate. Yesterday a bill came up in the Senate that would have blocked guns in the hospitals. An attempt by Senator Barbara Bollier (R-Mission Hills) to change the law for college campuses ran into a buzz-saw of NRA talking points leveled at her by Senator Ty Masterson (R-Andover), Senator Mary Pilcher-Cook (R-Shawnee), and Senator Rob Olson (R-Olathe). Olson maintained that more people are killed by cell phone usage in cars than all other causes of accidental death and noted that killers seek places with a “no guns” sign because they know they will be safe targets. He asserted that law enforcement can’t get to a scene quickly enough and that every law-abiding citizen ought to be able to pull out a handgun and fire back. Olson then offered a motion to refer the bill back to the Federal and State Affairs Committee (one with a more NRA-friendly membership) but at that point Senator Vicki Schmidt (R-Topeka) offered a substitute motion to refer it back to the Ways and Means Committee from which it had originally come. Schmidt’s motion prevailed and the bill was sent back to committee. Without further action, all community colleges, technical colleges, and universities in Kansas will become gun zones on July 1, 2017. Anyone will be permitted to carry a concealed weapon anywhere on campus at any time. We believe this includes campus daycares and public health clinics operating as part of joint programs with colleges. No permit will be required; no training will be required. The Conference Committee on Pensions has come to an agreement to simplify the requirements that address Working after Retirement for KPERS covered positions. The contents of the changes were put into House Substitute for Senate Bill 21. The bill addresses the many issues that arose after the 2016 set of changes were implemented.